We are constantly reporting on new materials and interesting product developments which offer weight savings whilst, at the same time, increasing safety factors. The result: lighter, faster, safer and more exciting sailing. 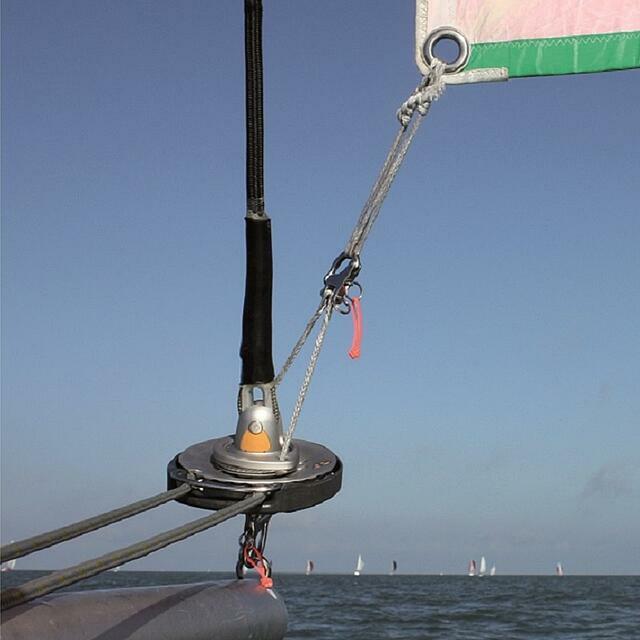 "Top-down" and "bottom-up" furling are expressions used primarily for continuous line furling systems using a torsional cable/rope, around which the sail furls. As opposed to a traditional foil furling system, used on cruising boats, where the jib/genoa is hoisted in a luff groove in the aluminium foil and the sail furls around the full length of the foil. Continuous line furlers have evolved in line with the popular growth in the use of Code Zero sails. The Code Zero is a relatively deep, lightweight, reaching sail. It is referred to as a "straight luff" sail where reasonable luff tension is required to enable pointing. The torsional cable is enclosed in a pocket which runs up the luff of the sail. The sail is lashed to the thimbles of the cable at both the tack and head. The cable sits with the sail in the sail bag, already tightly furled. When it comes time to deploy the sail, the cable thimbles are attached to the furling drum at the tack and a swivel at the head, hoisted as a long sausage and tightened. To unfurl, the continuous line drum is allowed to spin freely until the sail is fully deployed. When it comes time to furl away the Code 0, as the furling drum starts to turn, it starts to wrap the bottom of the sail around the cable first and the furl gradually works its way up the luff of the sail - hence the expression "Bottom-up". The emergence of top-down furling is a much more recent phenomena. As Code 0's became more popular, so too did asymmetric gennakers, particularly in racing circles where they were looking to optimise their downwind sailing angles. Asymmetric gennakers are really an extension of the code zero, they just get deeper and lighter as the desired sailing angle becomes lower. 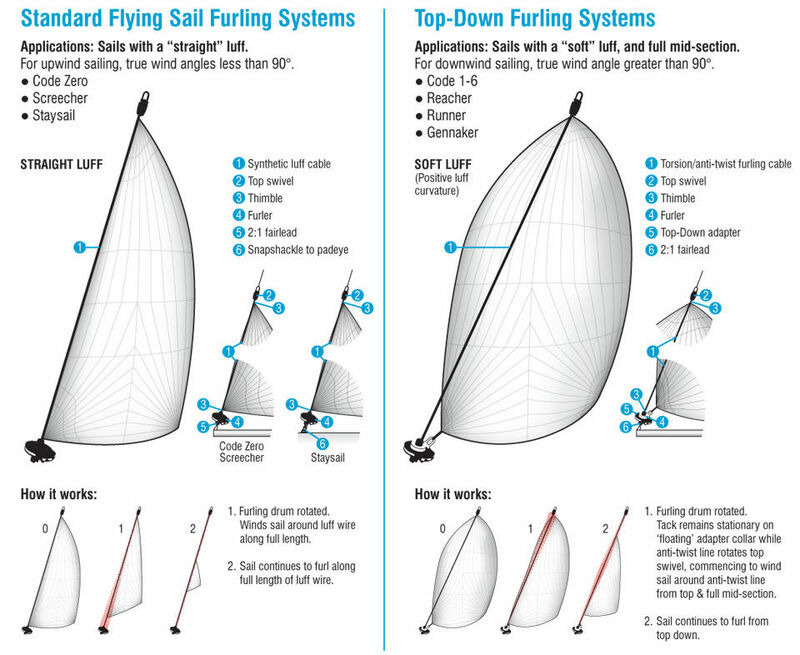 However, there is one fundimental difference between a gennaker and a code 0: as you sail deeper you want the whole sail to be able to rotate around the forestay plus you achieve greater sail area with more positive luff curve compared to a tighter reaching sail which requires a straight luff. 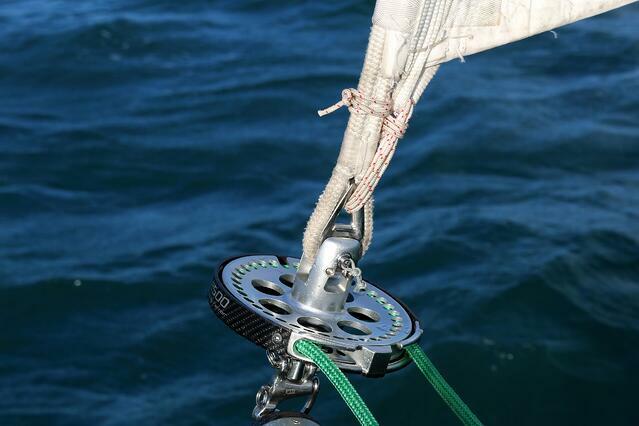 Therefore, Gennakers require a free flying luff which is independent from the furling cable. The traditional method for dousing a spinnaker was a snuffer but with the increasing use of bottom-up furling for code zero's, and their similarities to asymmetric gennakers, people started to experiment with continuous line furlers. Initial attempts at standard bottom-up furling proved disastrous. Due to the depth of the centre of the sail, compared to the corners, the furl would start at the bottom, but before the centre of the sail was furled away, it would also start furling from the top-down, leaving a large pocket of air trapped in the middle of the furled sail. There is plenty of debate about who actually started the top-down furling craze but the solution to effectively furling away these deep downwind sails was to allow the furl to start at the head and leave the tack of the sail to rotate freely at the bottom, unconnected to either the cable or the furling drum. The result: the furl is transmitted from the drum, along the full length of the furling cable and starts at the head of the sail and all the air is squeezed out of the sail as the furl travels down the cable to the tack. To get a complete guide to specifying and purchasing continuous line furling systems please download our "Furling System - Overview" document.